Today, we’re traveling to Kandy, Sri Lanka to enjoy delicious street food in Sri Lanka and some of the best vegetarian food in Sri Lanka and also some really flavourful rice and curry in Kandy! This Kandy Food Market adventure we’re bringing you on is worth watching! 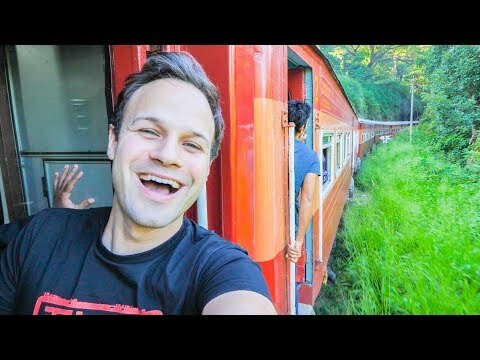 This is the FULL-ON Sri Lankan beautiful train ride adventure! First up, we’re taking the morning train from Colombo to Kandy to experience the true natural beauty of Sri Lanka. This was one of the most beautiful train rides we’ve ever experienced. The beautiful countryside of Sri Lanka was stunningly pristine and worth flying in just to take this train ride for. The train traveled fairly slow so you can watch out the window and bask in the beauty for the whole 3 hour ride. After arriving in Kandy, we’re bringing you to a famous Sri Lankan spicy rice and curry joint to try the famous Lumprais AKA Lumprice. Here at Sri Ramya in Kandy, there is a ton of selection of spicy curries and Sri Lankan famous specialties, like Kotthu, Biryani, Chicken curry, and Lumprice. We came specifically to try the lumprice, so we went upstairs to see how it was made. An entire banana leaf is cut up into sections and then each section is filled with the most aromatic spice infused rice and topped with extremely flavourful curries. At Sri Ramya, there was an onion sambal, some delicious and sweet eggplant moju, and some super tasty and spicy chicken curry. After this amazing Lumprice meal, we’re going to a famous vegetarian food hawker area called Hela Bojun food stalls. There are various outlets in Kandy. What’s so amazing about the Hela Bojun stalls is the joobs that each centre creates for local women to empower them to run their own business. We tried some delicious dosa and local curries. After this, to finish off our street food tour of Kandy, we’re going out to the local Ceylon tea fields to have a cup of ceylon tea. It was very sweet, perhaps a little too sweet! And the vegetable roti was probably the worst roti I’ve ever tasted. But that’s alright, the scenery was magnificent!